For the past couple years I have been somewhat passively researching Bière de Garde and I think the time has come for me to start being a bit more active about putting this info together into blog posts. Before getting into the brewing side I wanted to start with this an introductory/general post to address terminology and the setting for the beer. For clarity throughout this post, I'll use capitalized "Bière de Garde" to refer to the specific family of beers from the north of France and I'll use lower case "bière de garde" when using the term to more generally refer to aged beers. If this doesn't make sense, it should shortly. A question regarding brewing a bière de garde from Ghent. (Petit Journal du Brasseur, 1901). Discussion of bière de garde from Augsburg and Munich, Lacambre (1851). I find Bière de Garde to be one of the trickier families of beer to discuss based on the wide range of what this name can mean. To the non-Francophone beer world this term likely refers fairly unambiguously to a distinct (though still stylistically open) category of beers from the Nord and Pas de Calais departments of northern France. But the non-Francophone beer world might not be as familiar with this term to apply generally to a diverse category of aged beers, using the term for its literal meaning (beers for keeping/storage, or since this part has been done already by the brewer, beers that have been kept). The historic Belgian brewing literature regularly uses this term to discuss general beers designed to be aged. And these beers could cover quite a range of strengths, ingredients, and brewing styles. In the modern world I think bière de garde is used less generally, but when looking through the historic texts the French Bières de Garde are definitely in the minority of the uses of this term. Just as the French-language brewing literature may use the term bière de garde to refer to beers unrelated to historic Bières de Garde, the modern beers bearing this name as a category are also fairly unrelated to the historic category. There is a discontinuity not only temporally between the historic mixed culture Bières de Garde that were found until the early 1900s and the modern range of beers bearing this name, but also in process and ingredients. For the rest of this post I'll generally be discussing historic Bières de Garde, focusing on the period between industrialization of breweries and when the historic versions disappeared in the early 1900s. 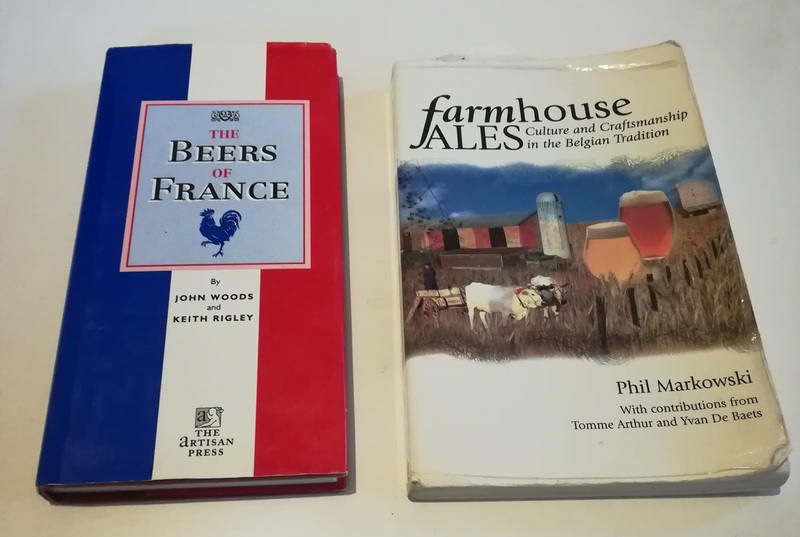 For those interested in the rebirth of the name and the modern iterations, Farmhouse Ales (by Markowski) and The Beers of Northern France by Rigley and Woods give a good idea of the story and the range of producers. The former should already at least be on the list of any Anglophone brewer interested in Bière de Garde and saison, if not already read and re-read multiple times. While the latter is a bit dated, it can be found (at least now) for ~5 USD / EUR. It is certainly worth that if you're interested in French beer. 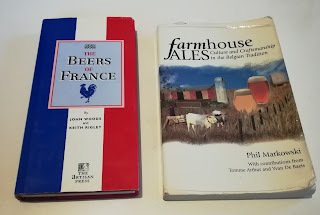 Recommended reading for modern Bière de Garde. While France may not have had always the beer focus of some of its neighbors, many distinct regional beers were brewed in the 1800s and earlier. Around 1850, Lacambre (Traite Complet de le Fabrication des Bières..., 1851) describes distinct regional ales from Paris, Strasbourg and Lyon in addition to the beers of Lille. I should note that Bière de Garde is generally discussed under the category of beers of Lille in the historic texts I've seen (Lille is the most prominent city of the Nord department). I am combining Nord and Pas-de-Calais for this discussion as modern Bière de Garde brewers can be found in both departments. But most of the historic documents I've seen mention Lille, and possibly the Nord in general, as the region for Bière de Garde without addressing Pas-de-Calais. This diversity of regional beers seems to have changed quickly, as Figuier (Les Merveilles de l'Industrie, published in the 1870s) notes that Paris had switched rapidly to lager brewing starting in the late 1860s, modeling their beers after those from Bavaria and Vienna. During this time the brewers of Lille continued to produce their beers of top fermentation - these including Bière de Garde as well as an ordinary brown beer (which was served young) and table beers. In addition, some brewers produced a white beer (which I've written about here), though this was not very common. Northern France, western Belgium and some larger cities. The resilience of the north, though strong, was unfortunately not enough to preserve these beers. Evans (1905) and Moreau and Levy (also 1905) both note that few regions of France were still producing top fermentation beers in 1905. 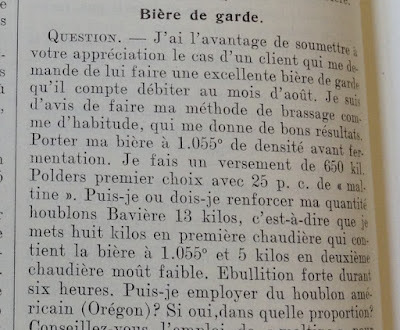 And Evans notes that Bière de Garde was rapidly becoming less popular, having fallen from 50% of the consumption of Lille in 1900 to less than 20% in 1905. With Bière de Garde already on the back foot, WWI was pretty much the end of the style. As I've written about a bit in this post, the devastation the region faced and the way this put additional pressure on breweries (loss of life, loss of equipment, insufficient crops to maintain production, etc.) resulted in a significant loss of breweries and the regional beer identity compared to before the war. This basically signals the end of traditional Bière de Garde production. The table below shows brewing trends in the north of France in the early 1900s (the number of breweries and production volume, in degrees-hectoliters). This is presented for both the Nord department alone as well as the 5 northern departments of France that were more prominent beers regions (including Nord and Pas-de-Calais). While the date coverage is a bit spotty, there is a clear difference between the early 1900s (before WWI), where production and brewery numbers seem fairly stable and the 1930s. Other 1930s data as presented in Petit Journal du Brasseur 1939 are generally similar, though a decline in the number of breweries and some variability in total production are seen during the 1930s. 1939 was chosen for this comparison and it included both the number of breweries and the production volume for the same year. Some quick data on the breweries and production levels in Northern France in the early 1900s. The Bière de Garde revival, with distinctly different beers from the original Bières de Garde, begins roughly 10-50 years after this, depending on who you credit. Jenlain claims to have been the first among the new brewers to use the name Bière de Garde for their ale aged a couple weeks in tanks in the 1920s. Castelain employed the title in the 1970s for their lager CH'TI, also aged for weeks rather than months. It was not until around the 1970s and later that the name caught on to mean a new category of northern French beers. A few points are clear about the general nature of historic Bières de Garde. They were turbid mashed, as is discussed in this blog post. Additionally the beers were top fermentation mixed culture beers. And, given that they were aged for many months, they had some chance to express this character. This is in strong contrast to modern versions, where the beers may be lagers or fairly neutral ales (as well as ales with a bit more fermentation character) which are generally aged a couple additional weeks. This is sort of a strange contrast between the two Bières de Garde (along with some process differences that I'll get into in a future post), and makes them in effect two unrelated products. I think using the term bière de garde to refer to a beer with a bit more aging in the process is fine. And the modern use of the term does denote a specific category of beers (varied though that category may be, and although the aging is fairly short). But I think making a tie between the historic and modern beers of this name is tenuous at best. Perhaps it is better to brew the beer you like, call it something that makes sense and communicates what it is, and let the beer be just a beer without trying to invoke the historic lore of a beer brewed with fundamentally different ingredients and substantially different methods on different equipment. Alright, so this gives a bit of an intro into Bière de Garde - where it came from, when it was produced and differences between the historic and modern versions. I'm working on synthesizing recipes and process to put together a post detailing brewing these beers. I've already let a bit of that info out in the form of this post on the blog's facebook page, showing the OG, FG and acid profiles of Bière de Garde from around 1900 as well as modern lambic and Flanders acidic ale. Hopefully I'll have a brewing process/recipe-focused post within the next couple weeks. One thing that confuses me about biére de garde is that it's supposed to be a farmhouse ale, yet every time someone writes about it, they seem to only discuss commercial brewing of it. Is there any documentation of what biére de garde was like when it was brewed by the farmers? That's a good question Lars! I've been looking at the industrial side (and industrial period - early 1800s to mid 1900s) for now so I don't have much to add about real farmhouse versions. I suspect there is some info out there in more anthropological-oriented texts, as I remember you noting to me previously for saison. But I haven't gone looking for these very much so unfortunately at this point I can't speak to farmhouse bière de garde. Fair enough. I haven't been able to find that type of sources yet, either. I've looked a bit, but not very extensively. I keep hoping someone else will get there before me. I'll let you know if I find anything. Cool, I'd be happy to see a post of yours on the topic! Might be worth mentioning the fact, district Nord used to be Flanders before Belgium has been established, well really until the Vienna convention reorganized Europe. 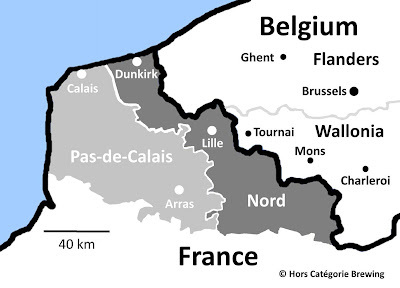 It still is referred to French Flanders today. As such, it makes sense to believe beer styles were very much similar all over Flanders (and Hainaut). A revival after a complete extinction will then follow new influences, meaning purely French in this case.